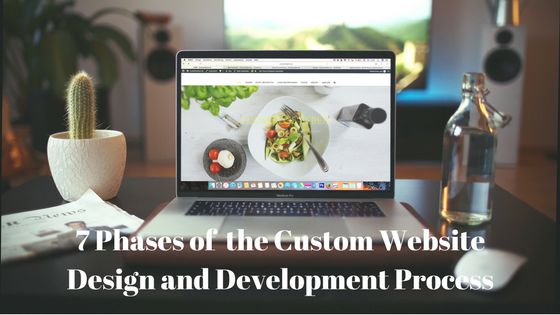 This blog post outlines the 7 Stages of custom website design and development process. As an integral part of any company website, this blog is slanted to help clients through the process of creating their own site. Online presence via websites is a boon for small businesses, as they can be such a fair leveler. A well-designed website, that is SEO optimized, can create a powerful image and listing in a google search, and in garnering increased customer interest as compared to other big players. Designing a catchy website is an art as well as science. Identify a good web designer who is technically sound and artistically inclined, as well and one who understands your requirements and will partner with you through the whole process. This is the most important step in the whole process, as it serves as the basis for other steps. Defining your requirements in terms of what is that you want to achieve or communicate with your customers, who your target customers are, is it going to informative or a selling platform, what are the features you would like to have, etc. is of paramount importance. The information gathered from the above step will be used to form the framework of the site, called as Site Map or Site Tree. Site Map is a structure of all main topics and sub-topics that are on the website and explains how they relate to each other. It must be designed in a way that it is user-friendly and easy to navigate. Discuss with your web designer as to what the technical requirements are – the kind of servers, programming languages, tools like CMS etc. Each of these decisions will impact the way the site gets developed, the final cost, the time taken as well as the result of business success. The outcome of this step is Wireframes or Mockups that gives a visual representation of the site to come. The next step of custom website design is to translate the wireframes into visual prototypes. Each element of the company like the logo, colors should be considered while deciding on fonts, images or the overall feel of the site, to ensure a unified branding strategy. The visuals of the site should be designed keeping in mind the target audience and what will best interest them. Your web designer should be able to create a couple of prototypes for you to decide on. Feedbacks and communication from both sides help in avoiding rework and waste of time and other resources. The more you communicate with your designer, the better he will be able to deliver. The custom website development stage consists of 2 aspects – the coding and the content. While coding takes care of the creating the home pages and other pages based on the site map, it also includes adding the static web page elements and other components that were defined in the initial planning stage. Once the structure is up, the next step is to fill them with content that has been created carefully, so that the various elements of it like the URL, title, and description are SEO optimized so that they give you a high visibility in Google search. The web designer should constantly check with the client to ensure they are on the same plane and that the site is getting developed as per the requirements. At this stage, the site will be tested for functionality and compatibility issues. It is important that the site runs smoothly on different platforms or browsers and performs well across many devices. Every link should be tested and re-tested to ensure smooth flow and to avoid broken links. After testing is over, on approval, it can be uploaded to the server using an FTP. One more final test should be run to ensure smooth functioning without any hiccups. Once the site is launched, it is important to closely monitor its performance to resolve issues and to ensure smooth performance. Updating content regularly and installing latest relevant plug-ins help in attracting regular visitors to the site and in converting them to customers. Regular software updates help to avoid bugs and in keeping the site secure. Custom website designing and launching don’t end just there. Ensure that all aspects of the project are documented well for future reference. Organize training programs for your team to understand and familiarize with the working of the site. Ensure that you have built in adequate flexibility to manage growing business needs and vagaries of time. Most importantly, remember that the website is an extension of your business and it is an intrinsic factor of your overall business and marketing strategy, so take enough care and thought in every step of the custom website design and development process to ensure success.